This autumn, Palazzo Strozzi in Florence will present Italy’s first major retrospective dedicated to Ai Weiwei, one of the world’s most celebrated and influential contemporary artists, curated by Arturo Galansino, Director General of the Fondazione Palazzo Strozzi. Visitors to the Palazzo will be greeted by Reframe, an architectural intervention covering the two main façades of the building with 22 bright orange lifeboats. A project that draws the attention to the lives of the refugees who daily risk their lives to reach Europe by crossing the Mediterranean Sea. 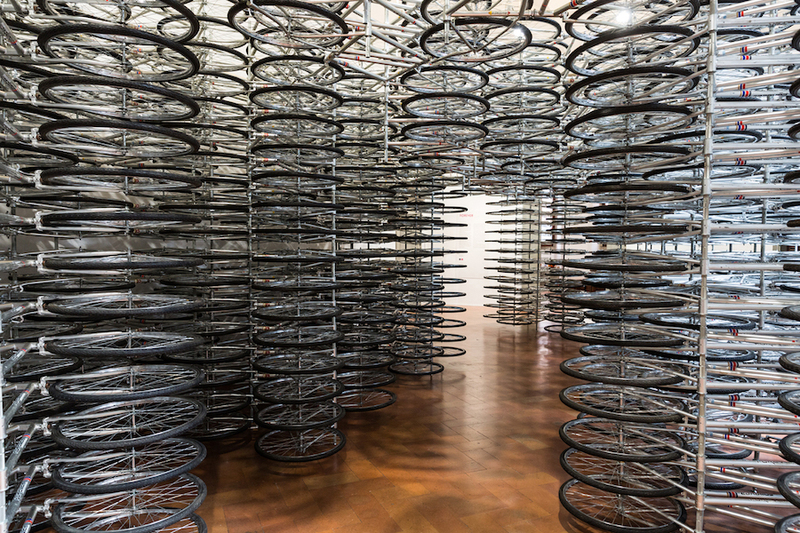 The installation ensures a direct introduction to the practice of this dissident Chinese artist. Ai Weiwei is known world-wide as much for his challenging contemporary art practice as for his political activism. The full exhibition will chart the artist’s practice from the ’80s to date, and will include key video works, assemblage and installation pieces from the past three decades, as well as present multiple new commissions including a new Lego portrait series. Mirroring the artist’s relationship between tradition and modernity, key works will be hung in response to the architecture of the Palazzo Strozzi. The 15th century palace was built as a political statement, and is considered to embody the history of the city of Florence. The vast, five-ton work, Refraction, created for exhibition on San Francisco’s Alcatraz island, will take over the palace’s courtyard. In the shape of an enormous metal wing, based on the structure of an actual bird, the work consists of reflective solar panels originally made for use as solar cookers in Tibet. This work becomes a metaphor for constraint, using the imagery of flight to evoke the tension between freedom and confinement. The show will not only offer a marvellous opportunity to explore Ai Weiwei’s creative genius, but also to understand his personal narrative, offering critical insight to Ai Weiwei’s ambiguous relationship with his native China. 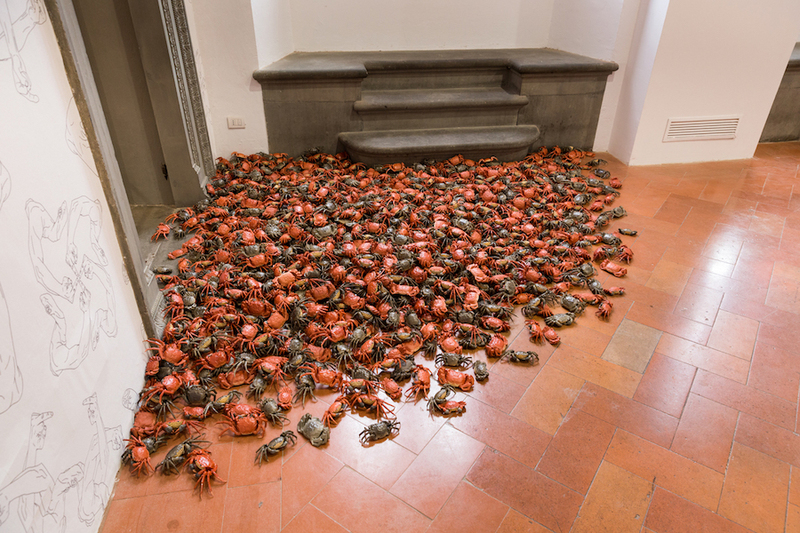 In his works, Ai Weiwei plays with both the ancient and the contemporary, showing an ambivalent relationship with his own country, torn between a deep sense of belonging and an equally strong sense of rebellion through the manipulation of objects, images and metaphors of the Chinese culture, denouncing the contradictions between the individual and society in the contemporary world. 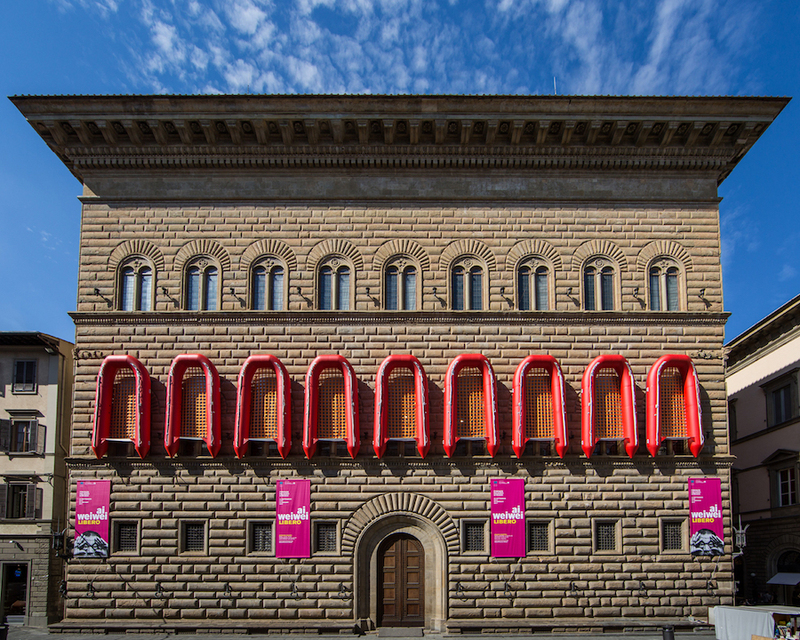 Ai Weiwei will be the first artist to exhibit across the entirety of the Palazzo Strozzi spaces, presenting a series of new and major works from the façade of the building and the courtyard to the piano nobile and the Strozzina gallery. Works on display will span from those created in New York during the ’80s and ’90s, when he discovered his “masters” Andy Warhol and Marcel Duchamp, to the large iconic assemblages from the early 2000s consisting of objects such as bicycles and stools, as well as recent works such as his portraits of political dissidents built with Lego bricks.